As most of you know, at the beginning of this year our family made some significant changes to the way we eat. One of the things that had to go (much to the dismay of our children) was candy. When you are avoiding high fructose corn syrup and artificial colors, it’s hard to pick up candy at the grocery. 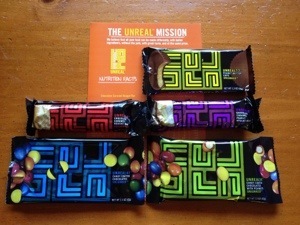 Unreal makes candy with real cane sugar, real milk, more cacao, and more protein and fiber; and WITHOUT corn syrup, artificial preservatives, hydrogenated fats, and artificial colors or flavors. But how does it compare to the “real” stuff? As the host for an in-home party, I was able to put my guests to the test…the taste test. (My kids loved this part). Everyone took a blind taste of “real” thing and then a taste of the Unreal thing. Unreal definitely held its own, and even surpassed the “original” in a lot of cases. Because of the higher amount of cacao, the Unreal chocolate has a darker chocolate taste (where the usual grocery store fare is milk chocolate). That was really the main difference noted by the taste testers. You can definitely taste the real ingredients in Unreal. One big difference was the size of the peanut in the candy coated chocolate with peanuts. The “original” has a peanut “chip” where Unreal has an actual, whole peanut. Definitely better! Overall, Unreal got great reviews. Everyone said they would definitely pick it up in stores (it’s available at many national and regional retailers). I enjoyed the opportunity to share better junk food with my family and friends. And I am thankful that I now have an option to give my children a treat that is easily accessible and doesn’t contain HFCS and artificial colors! And now for the disclaimer…I received product to review and share with my friends and family as well as monetary compensation for my participation in this campaign. The money did not have any bearing on the words I wrote. This stuff really is tasty and better for you (although, still junk food). I just have to make sure you now I was paid. But, whatever, you need to try it. A new week begins which means it’s time to post another menu plan and join in the Menu Plan Monday carnival at orgjunkie.com. Somehow our menu last week got all wopsidoodled, so there are several meals this week that are carry-overs. Last week’s pot roast with maple sweet potatoes and cider gravy was very good. I had to cook the roast for about 3.5 hours instead of the 2.5 hours in the recipe, so I ended up a little short on liquid when I went to make the gravy (I supplemented with additional cider and it was fine). Everyone in the family enjoyed the meal, so it’s a keeper. However, next time I will probably use some sweet potatoes and some white potatoes since Matt isn’t a big sweet potato fan. For more menu inspiration visit Menu Plan Monday. Have a great week! I’m back from vacation and feeding my family again. We had a great time on our trip (more on that to come later in the week), but it is wonderful to be home again and I’m looking forward to some home cooked meals this week (even if I am the one who has to cook them). The pot roast is a carry-over from a couple of weeks ago because I forgot to thaw the roast; I was quite disappointed because I’ve really been looking forward to that meal. The two soups are new-to-me recipes as well, so I’ll let you know next week how those turned out. I’m also planning to do some baking this weekend – homemade bread, apple cake, and maybe a few loaves of heavenly banana bread with bananas I have in the freezer. Happy Monday, and happy eating! BTW – I’m hosting a giveaway for a Temple Touch thermometer check out my review and enter to win! Let me just start out by saying that I feel like a blogging failure these last couple of weeks. My SIL has posted every day while I’ve struggled to get a MPM post up each week. And she has a NEWBORN! It isn’t about a lack of blogging fodder, just a lack of desire and willingness to take the time to post. Oh well, I’ll get back to it eventually. For more menu inspiration, check out Menu Plan Monday at orgjunkie.com. The other day when I was trying to make the menu plan and grocery list, Matt and I discussed how useful it would be to have some of our past menus to look back at for meal ideas. So, in an effort to do just that, I am going to try to start participating in Menu Plan Monday again on a regular basis. Looks like I’m all about comfort foods these days. I’ll blame that on baby girl. For more menus and meal ideas visit orgjunkie.com. For more menu inspiration, visit I’m an Organizing Junkie. I’m a girl of many flavors – chocolate, peanut butter, caramel. Depending on the treat and my mood I’m pretty flexible with the whole sweets thing (as long as there is something sweet to be found). But when it comes to cake, strawberry is my favorite. And of strawberry cakes, the one my Mema made when I was young is the one I always fall back to. Maybe it’s nostalgia, maybe it’s not having tried the “best strawberry cake ever” yet, but this is the cake I choose. Every year I bake my own birthday cake, and I bake it from this recipe. If you try it, I hope you like it, too. Mix all ingredients by hand. Bake in 3 layers at 350 degrees for 20-30 minutes. Mix all ingredients together and spread on cake. Notes: I usually leave out the coconut and pecans (just because I’m weird like that). I also generally bake the cake in a 9×13 and ice it in the pan (just because I’m lazy like that). And be aware that the icing has always turned out quite thin for me (more like a glaze). 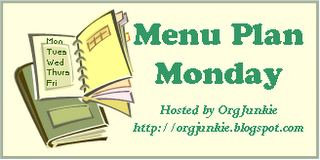 I’m running a bit late publishing my Menu Plan Monday post. At least it’s still Monday! Having my menu planned and posted really did help last week. We went through the whole week without eating out! (Well, except for the two days I stopped and got me and Little something for lunch – still working on the lunch thing.) Anyway, here is our menu for the week; there are breakfasts listed for the weekend because we will have company. Hope you have a great week filled with good eats! 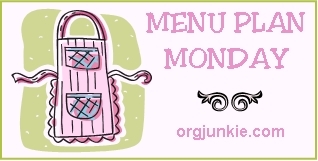 It has been months since I’ve participated in Menu Plan Monday (hosted by Organizing Junkie). With the new year upon us and the increased instances of dining out lately, I think it is time to join in again. You are currently browsing the archives for the Good Eats category.